This example uses simulated data to demonstrate the use of the nonpositional syntax (see the section Positional and Nonpositional Syntax for Contrast Coefficients for details) in combination with the experimental EFFECT statement to produce interesting predictions and comparisons in models containing fixed spline effects. Consider the data in the following DATA step. Each of the 100 observations for the continuous response variable y is associated with one of two groups. The EFFECT statement defines a constructed effect named spl by expanding the x into a spline with seven columns. The group main effect creates separate intercepts for the groups, and the interaction of the group variable with the spline effect creates separate trends. The NOINT option suppresses the intercept. This is not necessary and is done here only for convenience of interpretation. The OUTPUT statement computes predicted values. The “Parameter Estimates” table contains the estimates of the group-specific “intercepts,” the spline coefficients varied by group, and the residual variance (“Scale,” Output 43.15.2). 0.07352 0.01121 . . . The first ESTIMATE statement predicts the mean response at x = 20 in group 1. The E option requests the coefficient vector for this linear combination of the parameter estimates. The coefficient for the group effect is entered with positional (standard) syntax. The coefficients for the group*spl effect are formed based on nonpositional syntax. Because this effect comprises the interaction of a standard effect (group) with a constructed effect, the values and levels for the standard effect must precede those for the constructed effect. A similar statement produces the predicted mean at x = 20 in group 2.
as follows: construct the spline basis at x = 20 as appropriate for group 2; then multiply the resulting coefficients for these columns of the matrix with 1. The final ESTIMATE statement represents the difference between the predicted values; it is a group comparison at x = 20. The “Coefficients” table shows how the value 20 supplied in the ESTIMATE statement was expanded into the appropriate spline basis (Output 43.15.4). 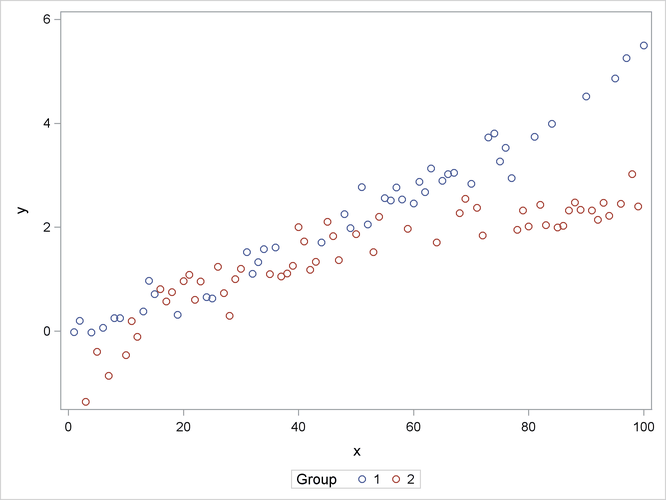 There is no significant difference between the group means at x = 20 (p = 0.8346, Output 43.15.5). There are significant differences at the low end and high end of the x range. 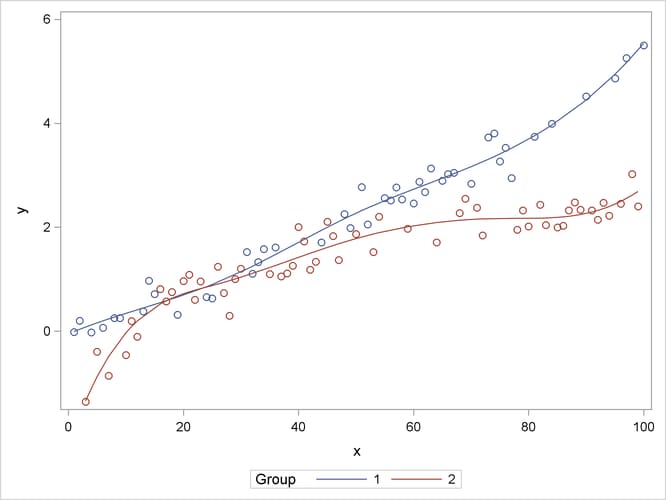 Notice that without the multiplicity adjustment you would have concluded at the 0.05 level that the groups are significantly different at x = 10. At the 0.05 level, the groups separate significantly for and .